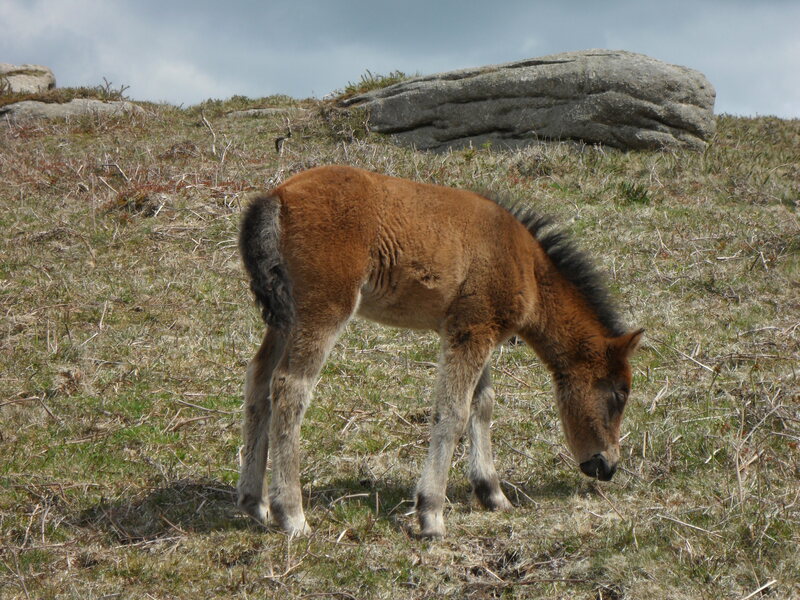 My first memory of Dartmoor dates back to the late 1980’s, on a university field trip. I can recall being cold, wet, and windblown, and there being many bogs of the peaty variety. 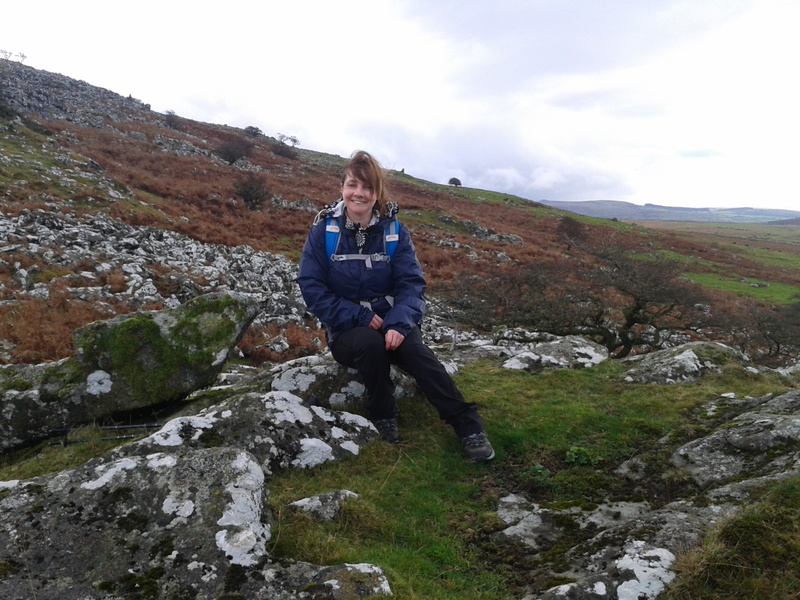 And we visited Wistman’s Wood, an area of ancient oak woodland just outside Princetown. I remember soft green moss- covered boulders, buried deep in dense oak woodland, the call of birds and the bubbling cascades of the woodland brooks. 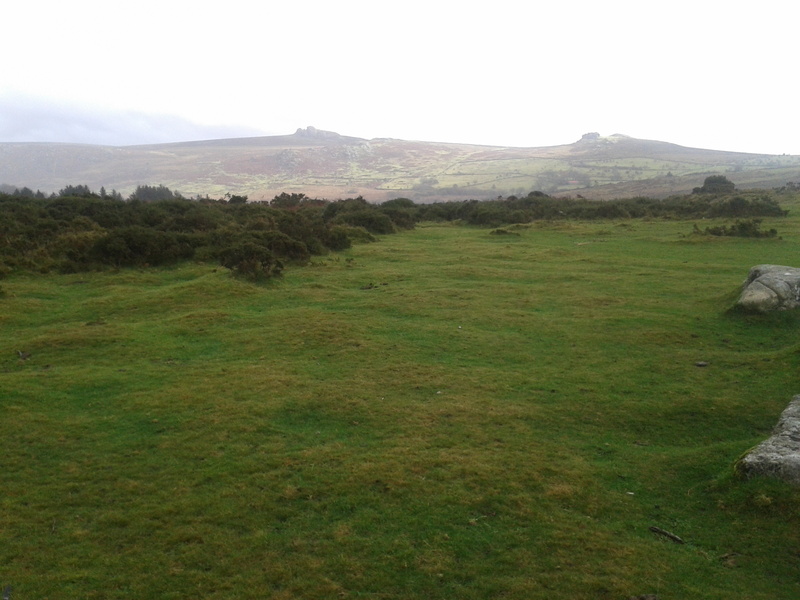 I’ve since visited Haytor on several occasions, Hound Tor and Bench Tor, but never really made it off the beaten track to explore any further. 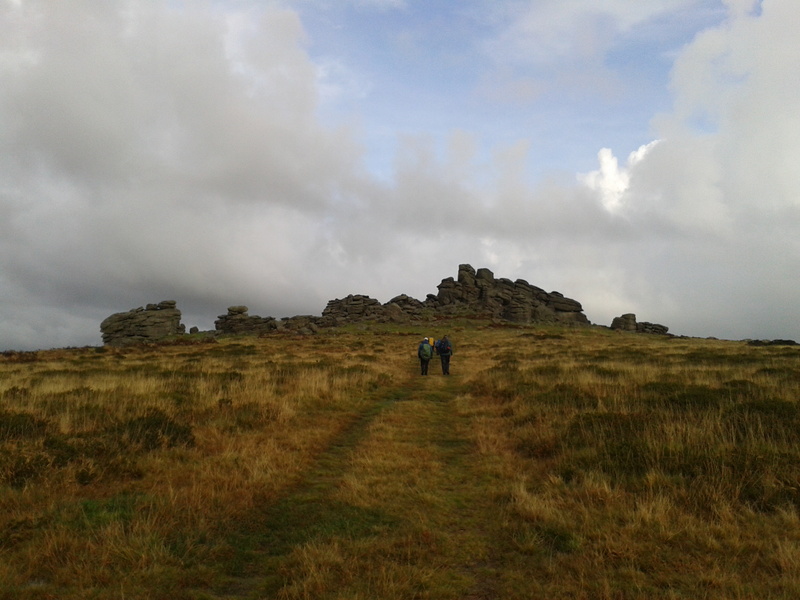 In October I received a tantalising invitation from Paul, a fellow social hiker, to spend the weekend with a group of Dartmoor rookies like myself exploring the moor from a base in Princetown. 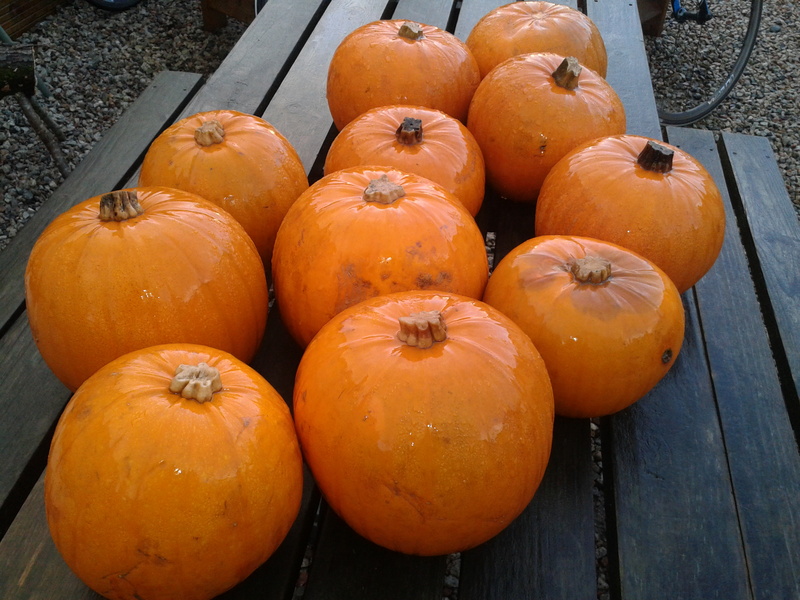 Camping had been suggested, but most of us (except for Phil and his trusty Vango Banshee) opted for the Plume of Feathers bunkhouse, due to the saturated ground from recent rains. We arrived just as dusk was falling, after 8 hours travelling. The rain lashed down on Dean’s car as we swooped round the bends, the headlights picking out the tall fern clad stone walls that bordered the impossibly narrow lanes. 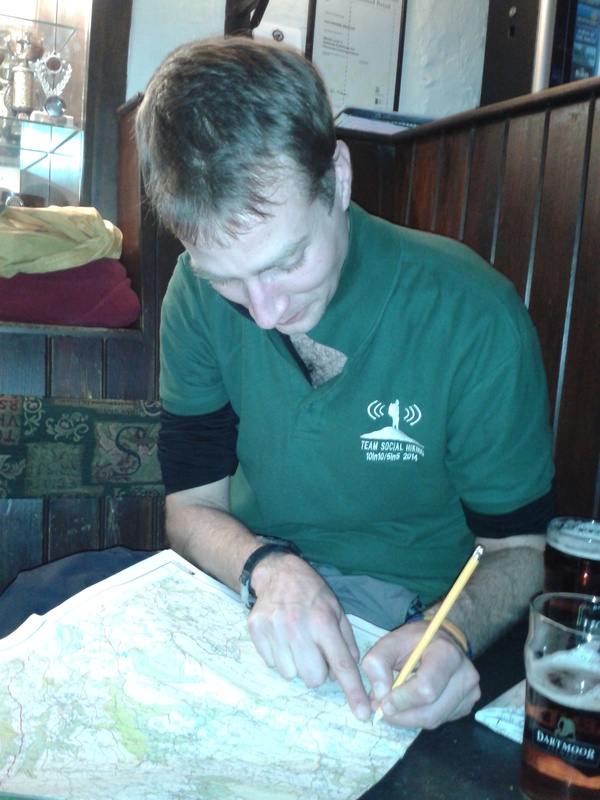 Phil (@socialhiking) with a map?! The next morning found a few of us feeling slightly the worse for wear, after one too many reunion shandies, catching up with friends not seen since the summer. Although the breakfast offerings in the Fox Tor Café looked delicious, I was still feeling too delicate to appreciate them. After paracetamol and a pint of orange juice I started to rally, hoping the rain would hold off for our first day on the moor. As we passed the camping field I glanced at Phil’s tent (looking lower and more bivvi-esque this morning, as though a great weight had fallen on it) confirming that my churning stomach wasn’t the only casualty of last night. I was going to write up this trip in the traditional way, but that’s already been done very proficiently by my walking companions. I’m going to link to their blogs at the end of this post for specific details of tors bagged and rocks reconnoitred. Dean has also made a video that captures the essence of the place much better than mere words can. 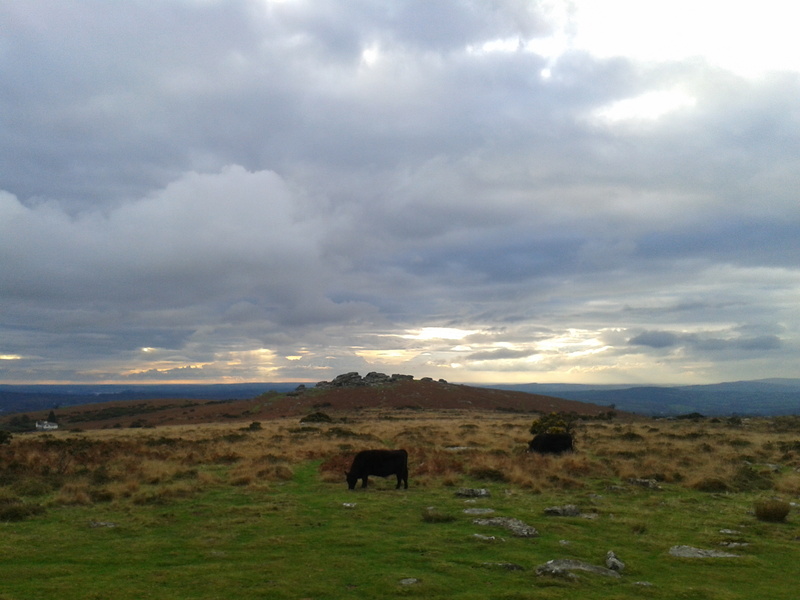 I’m going to attempt to write about how Dartmoor makes me feel, particularly in relation to the Lakes, another favourite place. The moor is an altogether friendlier landscape than the Lakes. 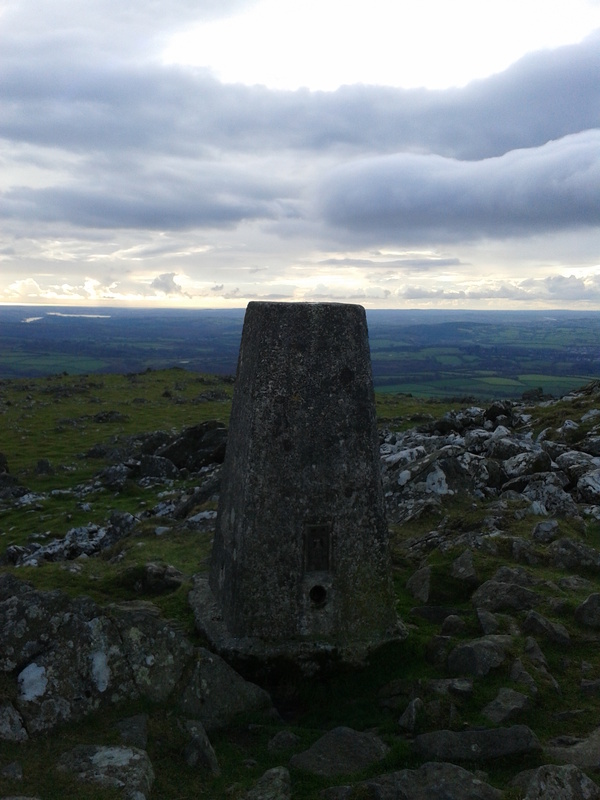 As you gaze at the vista of humps, bumps, rocks and hills you know that wandering up them won’t hurt your legs or scare you witless in the same way as some of the loftier Lakeland peaks. 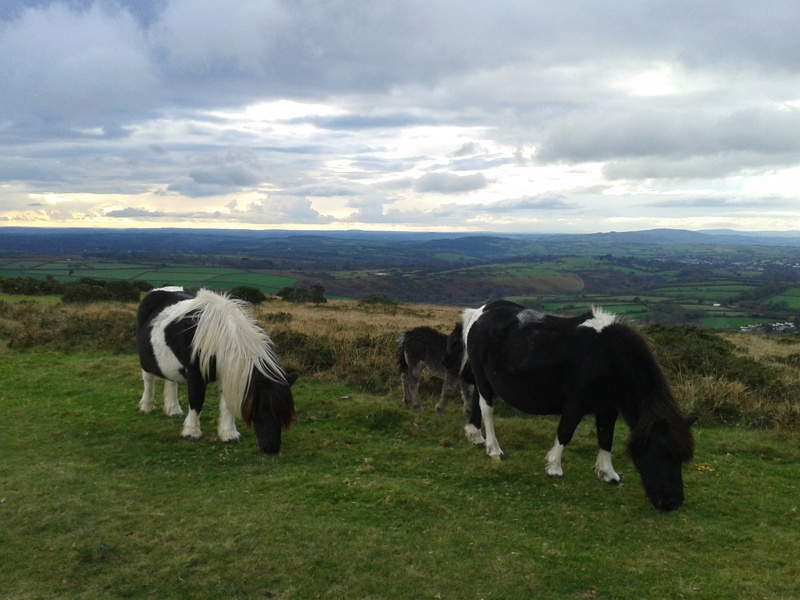 Dartmoor feels more accessible too. In Lakeland there are impenetrable areas hard to reach by any mode of transport. You know you need to walk 10 miles, and then camp, and then walk another 10 miles tomorrow. On Dartmoor, you can walk as far you want, knowing you can jump in a friend’s car and be back in the pub that evening for a pie and a pint. Not that that’s stopped me from wanting to camp there, a wander on the moor 2 years ago to photograph ponies decided that. The soft, close cropped grass and cushiony moss was almost begging me to put a tent up on it. It’s just that in the Lakes, camping is sometimes necessary to cover the ground in the time available, whereas on the moor it’s an optional luxury, which seems to make it even more appealing, and at the top of my list of places to camp this year. 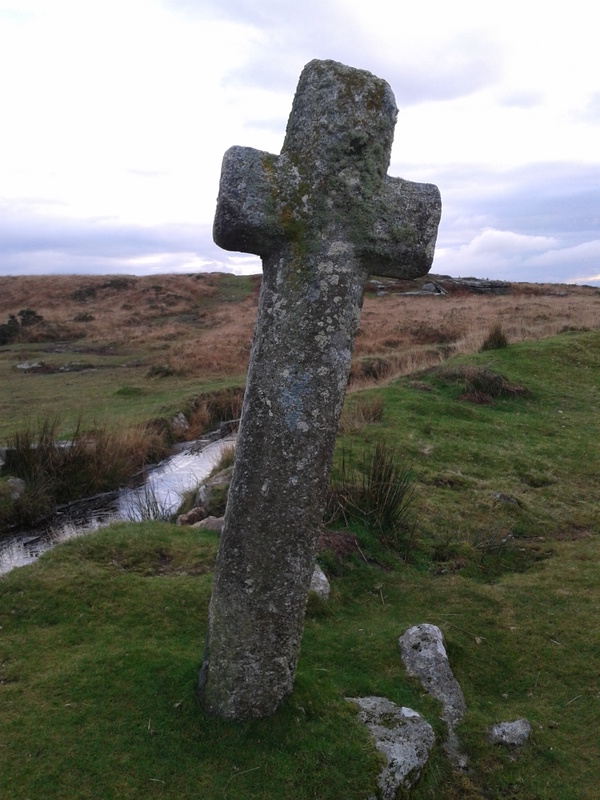 This trip has changed my feelings towards the moor. 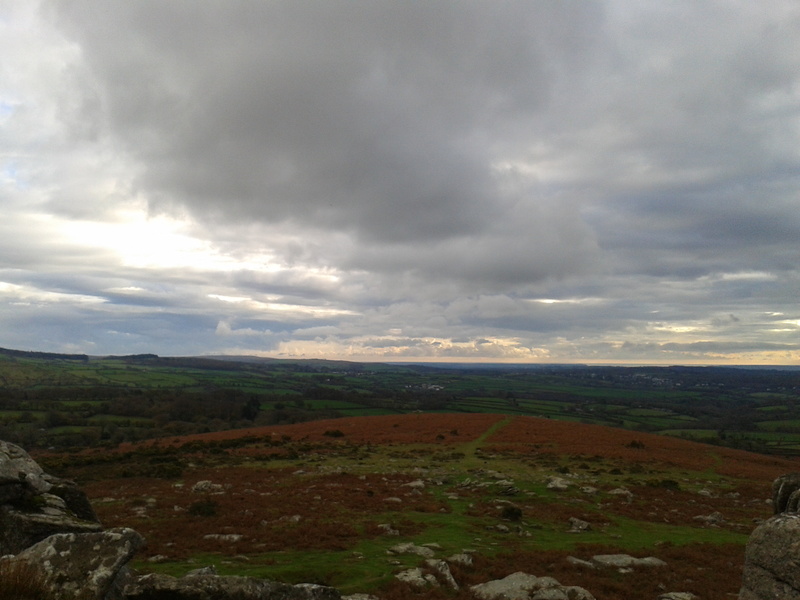 Before this weekend, it was just somewhere to head up for a walk on a sunny afternoon, and to see the dark brooding presence of Haytor over the market town of Newton Abbot, when bad weather comes rolling in. My visit has made me want to find out more, about the history of the industry there, the megalithic settlements, to learn to recognise the rocks and stones I’ve wandered over. I’ve become fond of this place, having visited several times. It’s one of the more accessible ‘tourist’ Tors, with two car parks, a visitor centre and even its own ice cream van. I still get excited though, when I spot the familiar curves of its granite mass, and friendly green slopes. 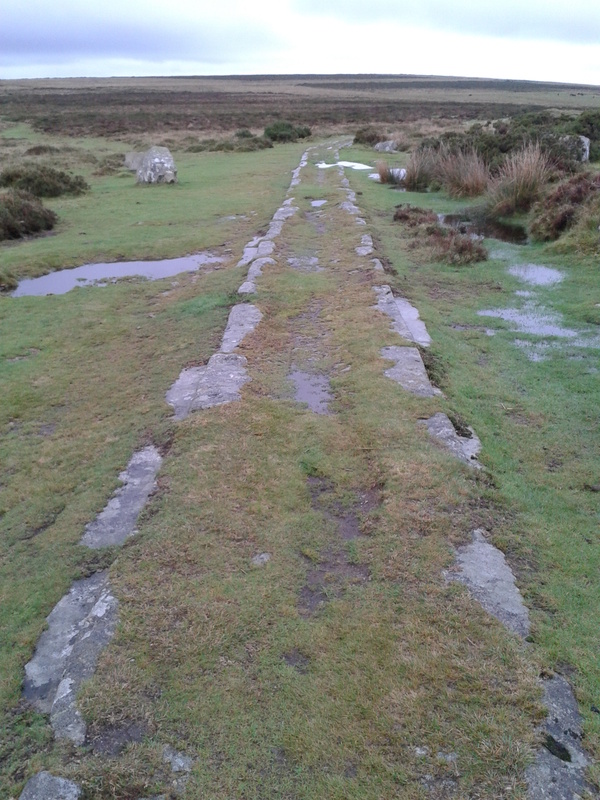 On this visit I marvel at the Haytor granite tramway, and wonder at the effort involved to manoeuvre those lengths of rock into position almost 200 years ago. This is a place of contrasts. Look one way and you see sparkling rivers and distant ocean, look the other and there is a close knit patchwork of green and ploughed fields, red Devon soil and cosy hamlets. Look another way again, towards the rolling distant hills, and you see the harsh grey of unyielding granite outcrops stark against the sky. 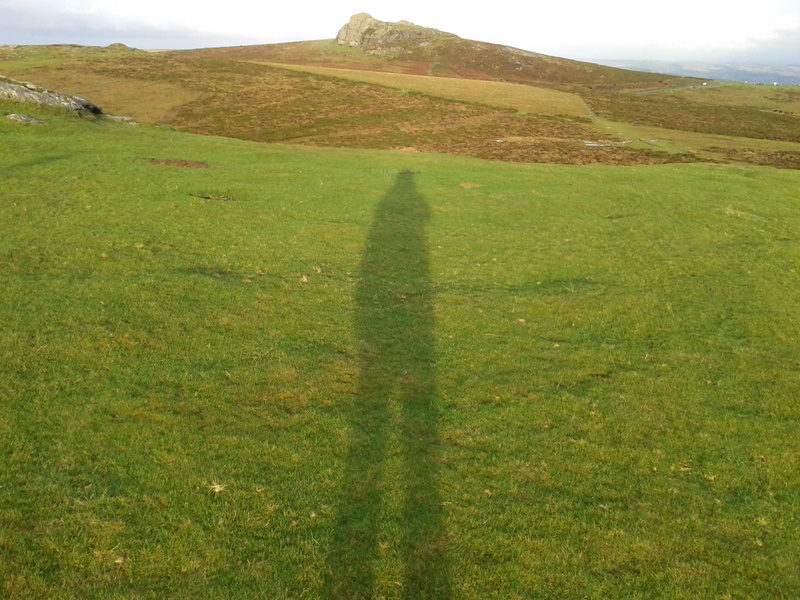 We wandered up the grassy slope towards the Tor, surrounded by the russet hues of the dying bracken. 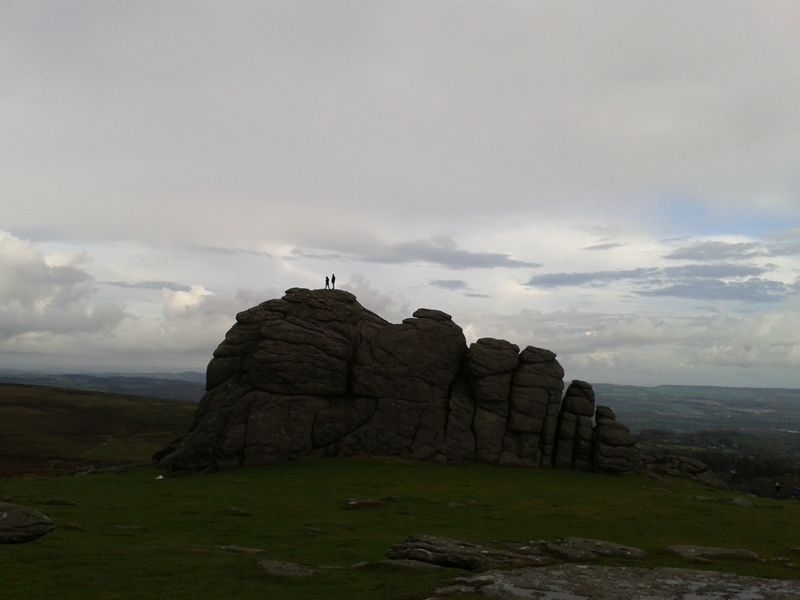 At the top were splendid 360 degree views, so I left Phil to meditate on the magic of Dartmoor (and to enjoy a crafty curly wurly), and headed over with Matt & Dean to bag Sampford Tor. I looked into their eager equine faces as I tried to extricate myself from a crowd of them and squeeze through the gate. I’d read strict pronouncements about them, don’t touch them, don’t feed them, do your best to ‘avoid’ them. The latter being particularly tricky when you’re crossing a field of them trying to do just that, and they are enthusiastically pursuing you en masse. Fortunately my pony related mutterings fell on deaf ears as Dean, chief horse whisperer of the party tickled them under the chin, behind the ears and generally did all the things you’re apparently not supposed to do. The ponies clearly hadn’t seen the advice either, and were evidently enjoying the attention immensely, even seeming to pose obligingly while Dean videod and photographed them. 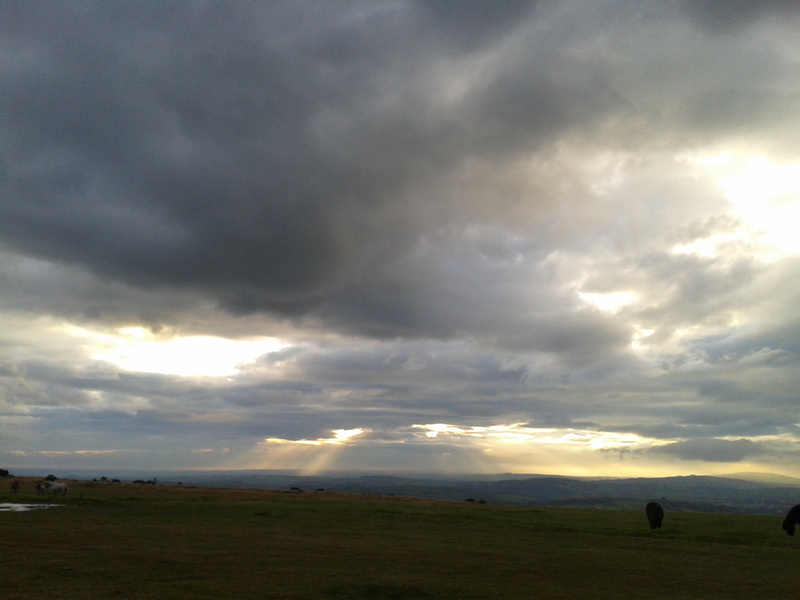 As the dusk crept up on us late on that Sunday afternoon, Dartmoor appeared to be putting on a most spectacular light show to distract our thoughts from the long journey north. 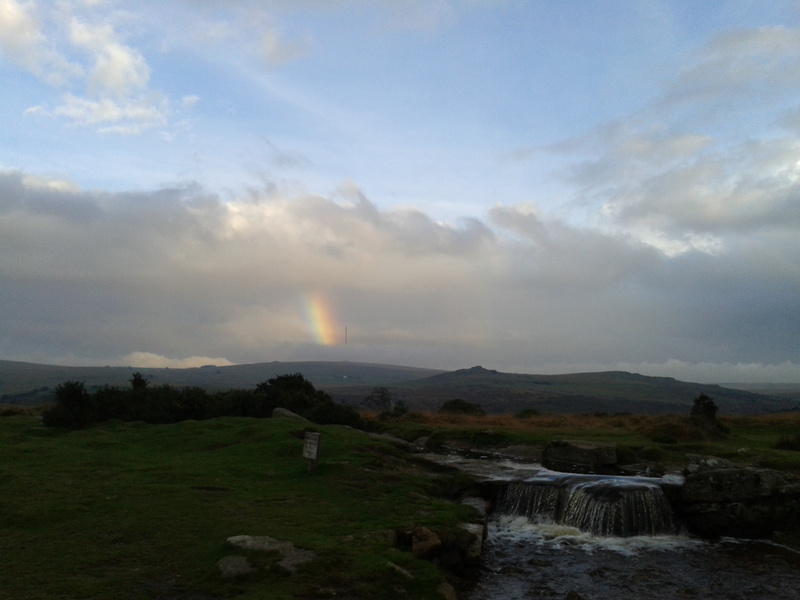 At the stone cross by the leat, a segment of rainbow shone over North Hessary Tor, almost like some sort of divine sign to ensure our swift return. From the green and brown of the moor, I raised my eyes and saw the heavy dark cloud pierced by the gold of almost ethereal shafts. 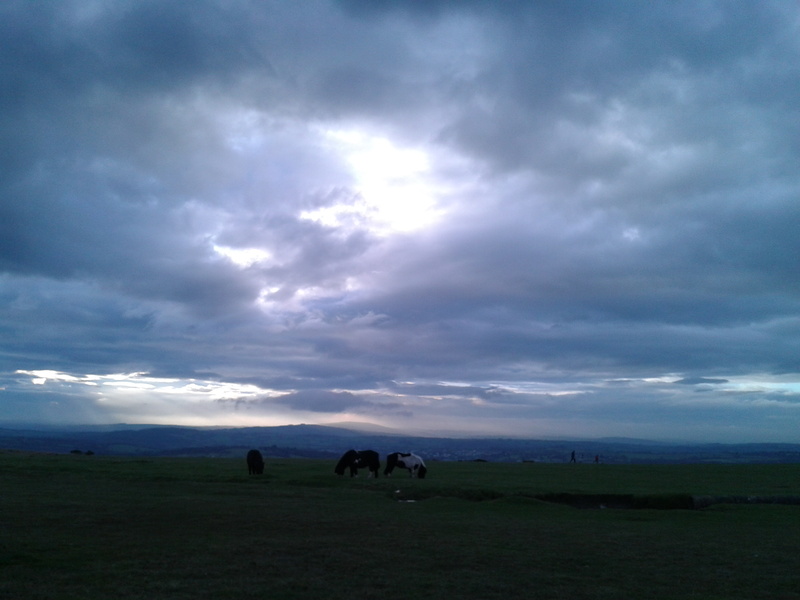 A final, almost furtive glance before we got in the cars at the green moor slowly darkening. The ghostly shadows of the ubiquitous ponies floated in the fading light, the cobalt blue of the late afternoon sky vying with the dark morose rainclouds, seeming to reflect my mood. The blue shapes of distant hills merging eventually with the sky at its misty horizon. 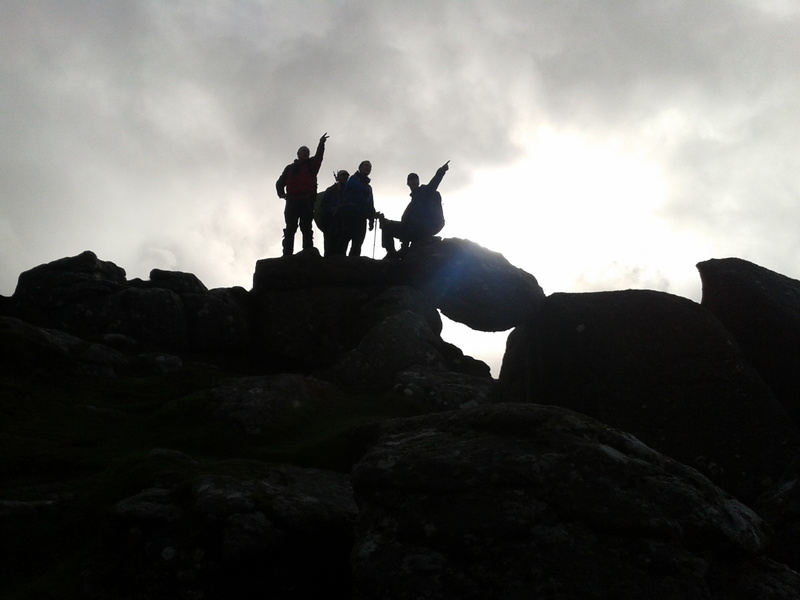 The unique shapes of Dartmoor in the form of silhouetted tors, bumps and rocks cast about the landscape like toys abandoned by some careless child. I knew I wanted badly to come back to this place, but what of the practicalities of sheer distance and cost involved in even getting here, never mind staying. Staying? Yes, Devon has been on my list of places I’d like to live for many years but the pull has been particularly strong this weekend. Yet the pull of the Lakes in the north is strong as well, and the creeping fear that I’m too old now to have the luxury of time to live everywhere I’d like. So some difficult decisions need to be made over the next 10 years, as to where I could live. I dare to hope that whether it be northwest or southwest, that I’m fit and well enough to enjoy whichever high places might become my playground in years to come. 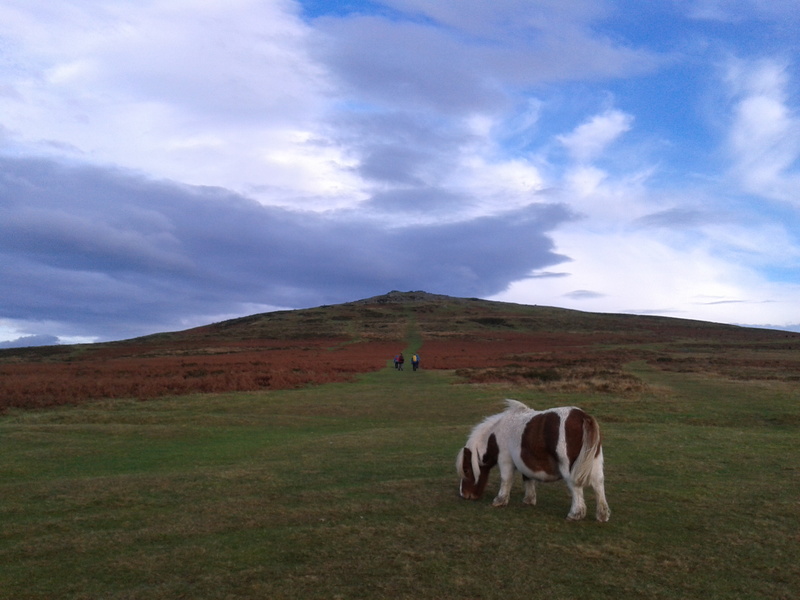 This entry was posted in Walks in the West Country and tagged Dartmoor, Fox Tor Cafe, Haytor, Hound Tor. Bookmark the permalink.